After landing in Rome to begin my Birthday trip and retrace my family history, I couldn’t wait to get out and do some exploring with my camera. 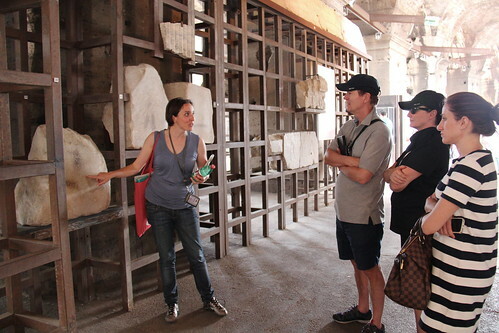 Rome is a city with some much history behind it, and I wanted to learn about it from a local who was born and bred there, so I opted to go on the Archaeological Discovery Tour with Urban Adventures to experience just that. Urban Adventures is a company owned by Intrepid Travel that offers travellers the chance to really get under the skin of the city they’re visiting, and experience it like a local. I’ve travelled with them before in other countries and have always enjoyed their tours, so I knew this one would not disappoint. We began our tour at the Arch of Constantine in front of the Colosseum where I was greeted by Vanessa, who by day is an Archeologist. 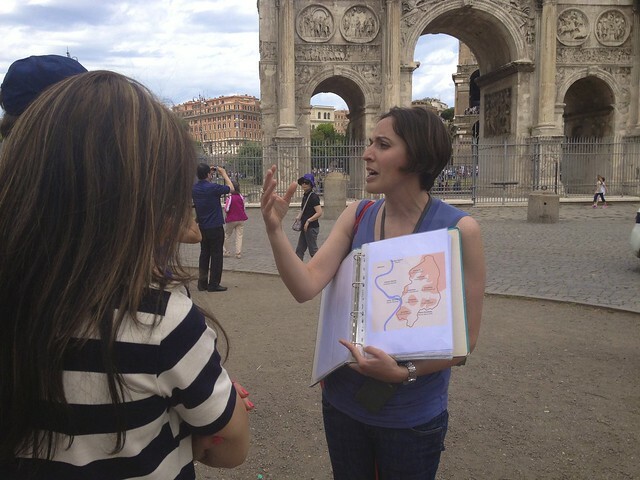 As I got to know her better throughout the tour, it was easy to see that she was so passionate about Archeology and Roman history, and she loved teaching other people about it too. At one point, I asked her if juggling both jobs (as an archeologist and tour guide) was challenging, but she simply smiled and replied, ‘it’s not hard work, when it’s something you love’. It was at that moment, I smiled back and said, ‘I know exactly what you mean’. 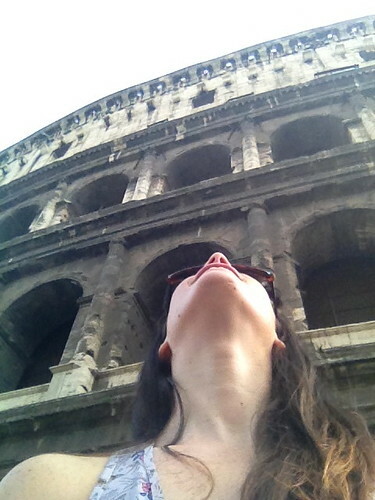 Here I was standing in front of the Colosseum; a place where my grandfather once stood years ago. I can’t even begin to tell you how much gratitude I felt in that moment. As Vanessa delved into the history of Rome and pointed out various points of significance around us, we then made our way into the Colosseum entrance. I was a little hesitant at first when I saw how long the line-up was, but Vanessa quickly ushered us another way informing us that we could by-pass the line and get direct entrance access. I felt like a VIP walking by all the tourists who were waiting in line for what seemed like hours. I have to say that Vanessa really made the history books come alive with this tour as we explored the sites of gladiator battles, animal fights and political trials. It made me realize how much I miss being a student (I can’t believe I’m saying that!). But I guess in a way, that’s what travel is all about; to teach you new things about the world. 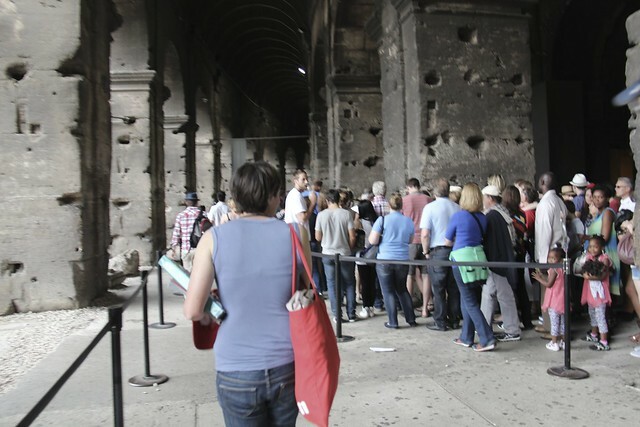 The big ah-ha moment however was walking in to witness the interior of the Colosseum in all of it’s glory. Even taking a panorama shot didn’t do justice to how jaw-dropping this was. It was at this moment that it really hit me… I’m in Italy. 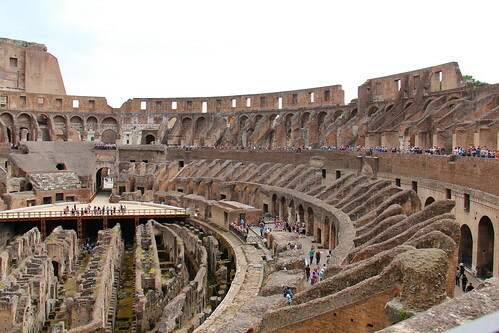 I admired this vast structure which once upon a time could seat over 50,000 people who came to see gladiators fight or witness other spectacles. 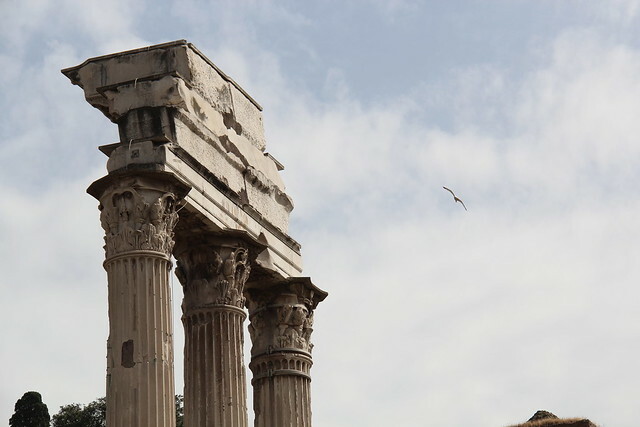 We continued our walking tour of Rome to the Roman Forum which was once the political and religious centre of ancient Rome. It’s origins date back to 7th century BC! It’s amazing that these structures are still standing! 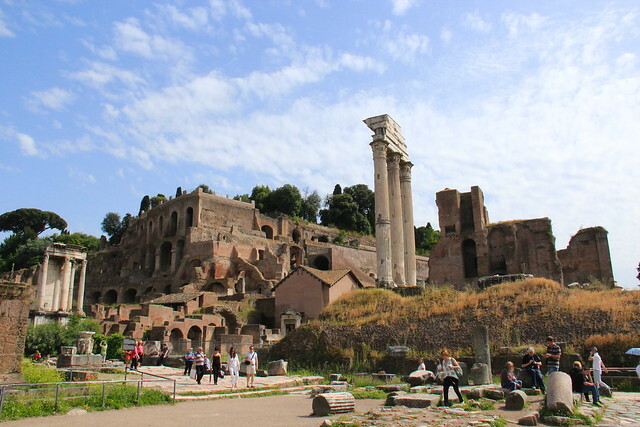 Not only did this tour energize me for the beginning of my Italian adventure, but it really gave me a better understanding of the life of the ancient Romans. We visited the Colosseum, the Forum’s most important buildings and temples; including the Temple of Augustus where the funeral of Julius Caesar took place, the Via Sacra (Holy road) which is the most important road in Rome, and the Curia which is the meeting place of the Roman Senate. But no Italian tour would be complete without a glass of vino and good companionship, which is exactly how our tour ended. 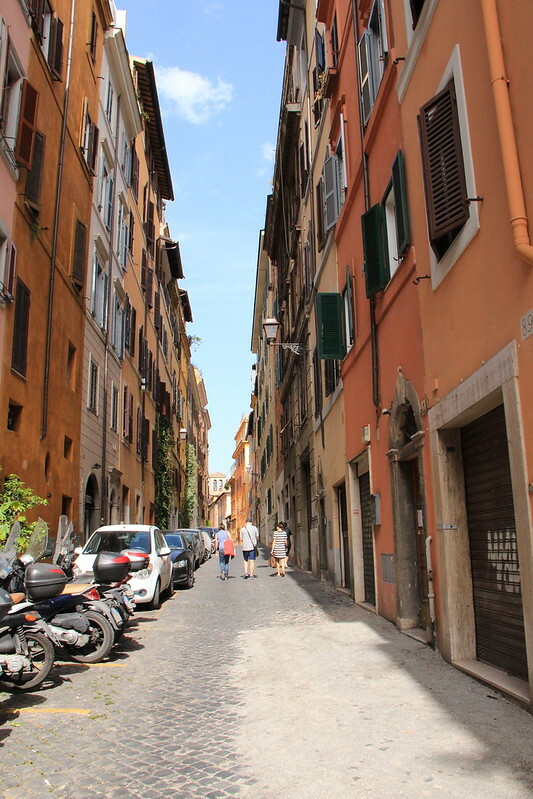 Vanessa took us through the quaint little backstreets of Rome to a wine bar where we socialized and conversed with others on our tour (a wonderful Aussie couple) and talked about where we were headed to next. If you’re heading to Rome, do yourself a favour and experience this tour for yourself to really understand the history and beauty of Rome. Having a local take you around, really enhances the experience, and is the reason why I love doing these Urban Adventures no matter where I am in the world. *editors note* Tour provided by Urban Adventures; all thoughts and opinions are my own. This looks wonderful! Makes me miss Italy so, so much more than I already do!